David Cameron has broken his truce with Gordon Brown over the financial crisis and launched a stinging attack on the PM's handling of the economy. He said Mr Brown's strategy had "fundamentally failed" and accused him of hiding from past policy failures. 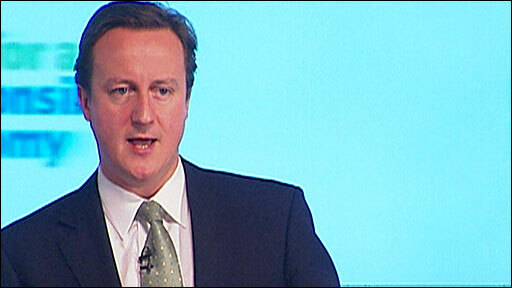 The Tory leader said he still supported the PM's bank rescue plan but said Mr Brown's mistakes had led to a downturn. Mr Brown brushed off the comments saying his undivided attention was on taking Britain through difficult times. He said the current crisis had "been created as a result of a global problem that started in America". And he added: "I think the whole country wants everybody who can to work together through these difficult challenges. " The prime minister has closed the gap on the Conservatives in the opinion polls since since the global financial system went into meltdown, with Mr Cameron holding off on direct attacks to avoid accusations of playing politics. But the gloves came off earlier, in a speech in the City of London, with the Tory leader attacking Mr Brown's "irresponsible" economic policies which he said had created an unsustainable boom. "We need change to mend our broken economy. This lot cannot do it - not least because they cannot own up to any mistakes," said the Tory leader. Mr Cameron said decisions made by Mr Brown when he was chancellor had led to a period of "irresponsible capitalism" and only the Conservatives had a plan to bring it back under control. He said he would "never pull my punches in explaining how this government has brought Britain down" and accused Mr Brown of a "complete and utter failure" in economic policy. He argued that New Labour had embraced free market economics "without question" without "properly understanding how it worked". And he said Mr Brown had "spent and borrowed without restraint" and ignored warnings about the consequences. The failure to control public and private spending over the past decade, leading to unsustainable debt levels, was an act of "intentional" negligence on the part of the government. The Tory leader accused the prime minister of basing his economic policy on "false assumptions". Among them were the ideas that a successful economy could be built on a "narrow base of housing, public spending and financial services" and "that you could abolish boom and bust and that the good times would last forever". "Over the past decade, we have seen a total breakdown of economic responsibility," he added. In contrast, Mr Cameron said he would entrench fiscal responsibility in government by setting up a new independent body - the Office of Budget Responsibility - to hold ministerial spending to account. The BBC's political editor Nick Robinson said it was Mr Cameron's objective to persuade people that Gordon Brown was the architect of the economic problems not failures in the global financial system. Mr Cameron called for a range of new measures which he said would create a more "balanced and resilient economy", saying Britain had become too dependent on property and financial services to generate its wealth. He wants to see much tougher regulation of the banking sector and changes to the insolvency laws to protect sound but struggling businesses. "Some people think that this decision - to support recapitalisation - means that we somehow now subscribe to the government's entire economic policy and doctrine," said the Tory leader. "Let me make it crystal clear - we do not. "And the complete and utter failure of their economic record has never been more clear to see." Ahead of Mr Cameron's speech, Shadow Chancellor George Osborne rejected claims the Conservatives had effectively agreed with Labour's economic agenda for most of the past decade and only recently raised concerns. "We fought general elections on the fact that government had overextended itself and borrowing needed to be brought under control," he told the BBC. Chief Secretary to the Treasury, Yvette Cooper, accused the Tory leader of indulging in "juvenile political games". "It is disappointing the day after the CBI called on the Tories to avoid playing party politics David Cameron has descended to do exactly that," she said. "It is ever more clear that the strategy of bipartisanship adopted by David Cameron at his party conference was just a short-term gimmick to get on the news, exactly the same rationale as his intervention today. "But at a time when the British people want calm leadership and serious policies to get through tougher times, David Cameron is engaged in playing juvenile political games." Lib Dem leader Nick Clegg said the Conservatives had "nothing of real substance" to say about the economic difficulties facing people, saying his party was the first to warn of the UK's "debt bubble". "People want practical help at a time of recession not Westminster political point scoring," he said.